At Woodland Creek’s, we’re proud to say our pine furniture for the dining room looks simply delicious! Mmm, mmm! What’s more delectable than a fine, home-cooked, family meal? Catering? No, no, no! 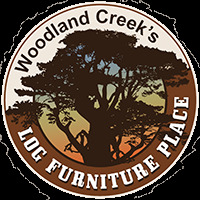 We’re referring to the many fine options in pine log dining tables, pine log dining chairs and benches from Woodland Creek’s. Show off your great taste in rustic furniture and country decor with pieces from our fine line of handcrafted kitchen islands, pine buffets, hutches – and a whole lot more! 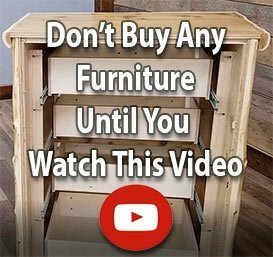 If you’re searching for the perfect fit in reclaimed wood furniture or log furniture for your eat-in kitchen, kitchenette, enclosed porch or bar area STOP right there. Happily, your search is over! Woodland Creek’s has wood furniture bistro tables and rustic decor swivel bar stools made of pine which just may make your mouth water. Browse our full line of pine dining room country furniture today! Rustic Decorating 101: Classic cottage furniture wakes up any old dining space! Is the decor of your dining space looking a bit outdated? It may be time to wake up your taste buds and reinvigorate your lodge, home, cottage or cabin with log furniture that packs a flavorful country decorating punch. Rough hewn dining sets help create a southwestern decor or cowboy decor feel while the smooth lines of family-style western furniture tables are big crowd pleasers.